Previous Page Page 1: Sewer pipe installation, Mally's, etc. Page 2: West end, & 40s pictures. Page 3: Just west of Livermore Ave. Page 4: East First Street. 1st Street just west of Livermore Ave.
First Street, Looking east toward flagpole. About 1920. 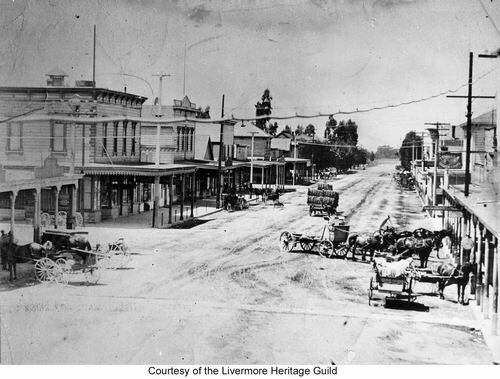 The Livermore Hotel is on the left, with the flagpole at its right edge. The Masonic building and the Schenone building are on the right. The Schenone building is the Bell Theatre entrance. 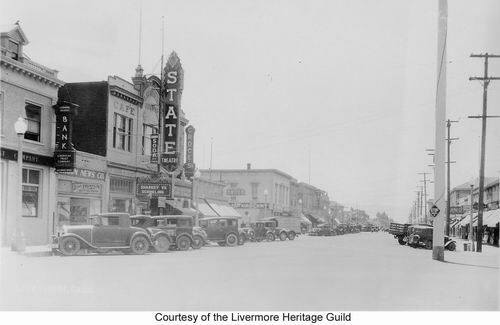 The name was changed to Livermore Theatre in 1923. Sign on side of Schenone building: Croce's Fashion Italian & French Restaurant. Bakery. Imported and Domestic Delicatessen"
Sign on building to the right of the Schenone building: "E. Cadloni", "American Bakery"
Sign on building to the right of the Livermore Hotel: "Standard Oil Company"
Between Masonic & Schenone: "... Soda Candy". Schenone: "State Theatre". Theater Marquee: "Wm Powell Star - .....". "Croce's" "Restaurant" (right portion of Schenone building). Right side of Schenone building: "Croce's Cafe", "Rome Beer on Draught", Jacob Rees & Son Sporting and Leather Goods Forester's bldg". "The Elite Ice Cream C...."
"Beazell Drug Store Pure Drugs", "Rexall Remedies", "Prescription Drugs", "Take Bromo-Seltzer"
State Theater. About 1932. Note location of flagpole (its original location). The building between the Masonic and Schenone buildings was constructed in 1932. 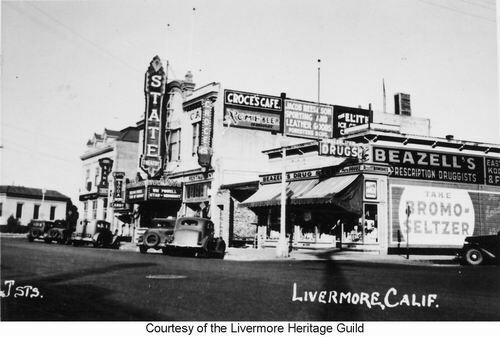 Masonic building: "Livermore Branch - Bank - American Trust Company"
Between: "....n News Co.", "B... Fountain Lunch Ice Cream"
Schenone building: "Ice Cream & Candy" (left portion), "Candy Soda Ice Cream", "State Theatre", Marquee: Sharkey vs Schneling", "Croce's"
Signs on right side of street: "..and.." (Candy? ), "Econ...", "Ice Cream"
First St. Looking west from flag pole area around 1890. North end of J St on left. The building on the left is has a sign that says "Palace Restaurant" under the overhang. The two story building to the right of it is Mally's (with the sign on top that peaks in the middle). IOOF building can be seen on right (two story with slanted roof line). Far right is the post office. The cable stretched across the street is a telephone cable which runs from the rail lines to McKown's Drug Store a the SE corner of 1st and J. Sign for Feidler's Fashion Stable in upper right (between the post office and the IOOF building). This picture is earlier than the one below (note two story building below instead of one story building to the right of the "Palace Restaurant" building - the two story building shows up in later pictures). Post office. N side of 1st St & J early 1900s. 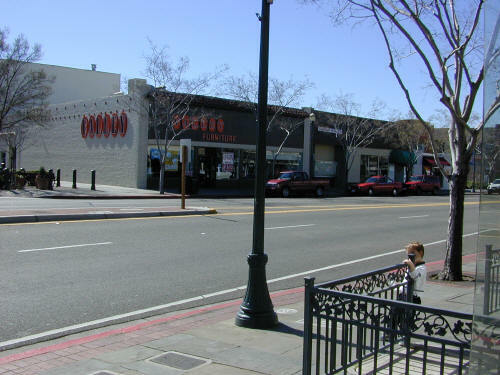 The post office was located here from 1904 to 1914, when it was moved over to the ease side of Livermore Ave. behind what is now the Independent Building. Building across the street on the left is on the SW corner of First & J St. They can be seen in the picture above also. 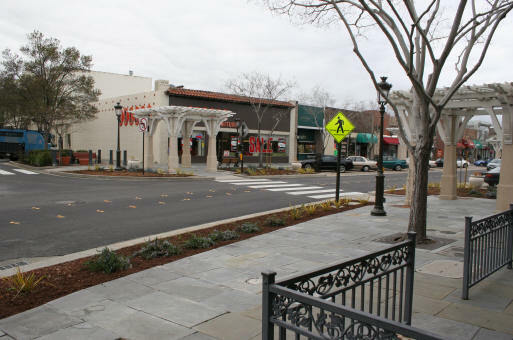 Mally's is the 2 story building in the center of the picture. Roughly the same angle March 2, 2003, standing at the entrance of the Sansar Restaurant (next to the fountain). 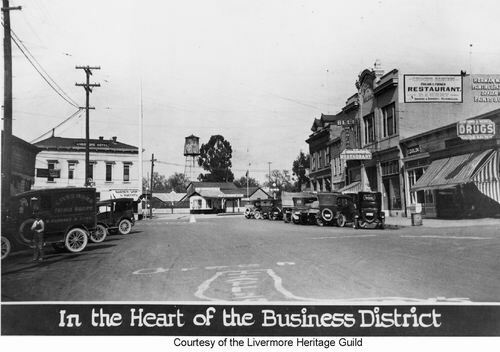 contains 128 pages of Livermore Historical photos and commentary. 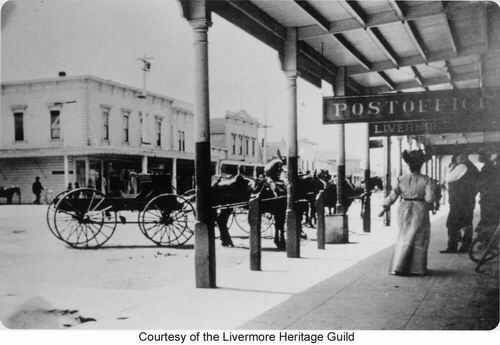 Livermore Heritage Guild History Center at the Carnegie Building.